Planning to achieve targets throughout the future period is the perfect complement to constant capacity planning. If you recall, constant capacity planning optimises the entire hospital right through the year, by re-profiling routine elective work to achieve constant beds, theatres and clinics. This avoids the high marginal costs of extra winter capacity and waiting list initiatives, so that you can do more activity at lower cost. 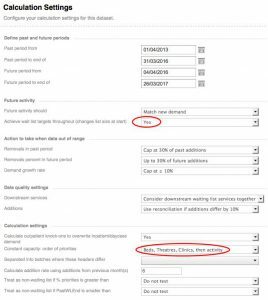 But the consequence of reducing capacity variation is an increase in waiting list variation: your waiting lists will grow and shrink naturally through the seasons, so you need to start off the year with a small enough waiting list to avoid breaching the target at the peak. 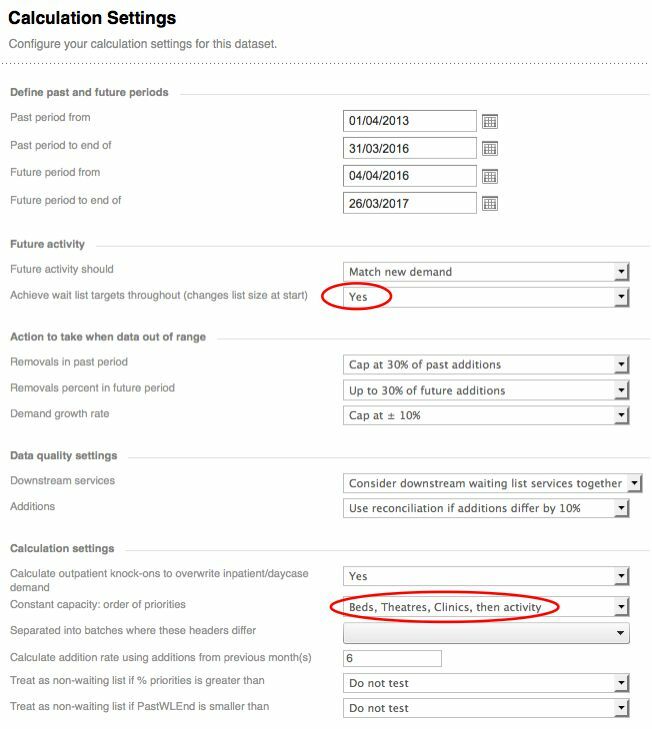 It’s easy to get Gooroo Planner to work it out in one go: when you run the calculations, just select both options – “targets throughout” and “constant capacity” – and Gooroo Planner will run the constant capacity calculations first, and then adjust the starting list size by just enough to achieve the targets throughout the future period. For instance here is a profile for General Surgery elective inpatients. This screenshot comes from a model of 43 clinical services, which ran through Gooroo Planner in under 14 seconds to deliver both constant capacity profiling and achieving the targets throughout. 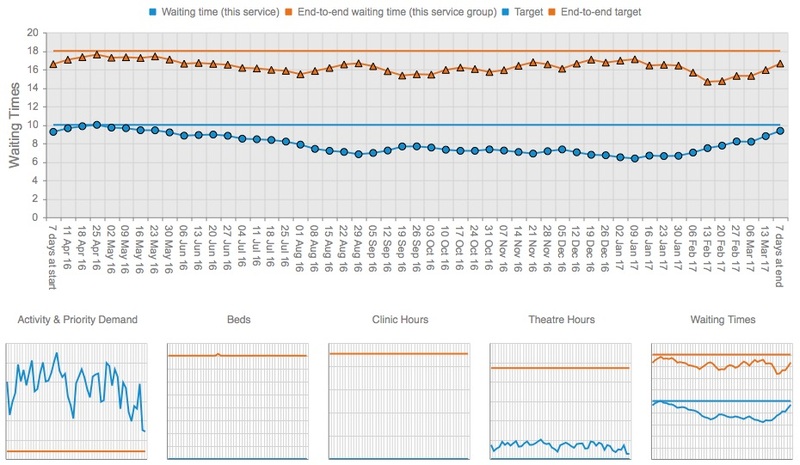 In the thumbnails at the bottom, the orange lines for beds, clinics and theatres show that constant capacity has been achieved – in total, across the whole hospital – throughout the future period. 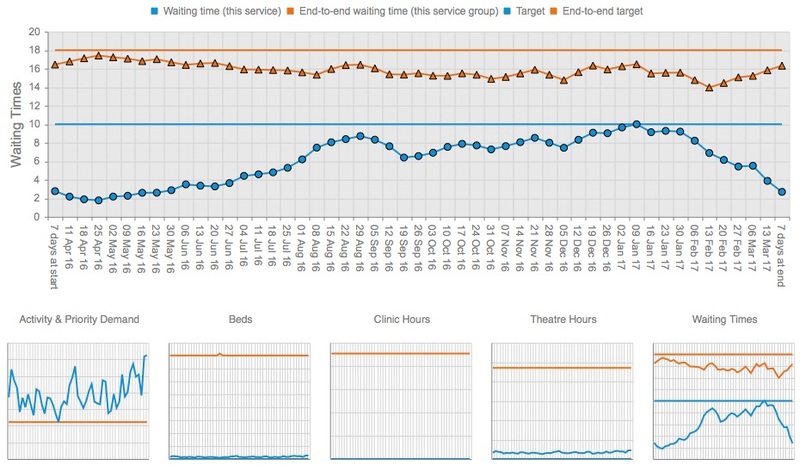 The large chart expands the waiting times thumbnail, and it shows (blue lines) that when waiting times peak in General Surgery elective inpatients, they peak exactly on target. Then the orange lines on the same chart show that referral-to-treatment waiting times also remain within target throughout the period. Just to prove that this wasn’t a fluke, here is the screenshot for Orthopaedic daycases. The constant capacity calculations have automatically set the daycase profile to run counter-cyclical to the elective inpatients, because that achieves constant theatre requirements, so the peaks and troughs in daycase waiting times show an opposite seasonal pattern to the inpatient services. If you want to see the calculation settings that were used to create this report, click the image below. 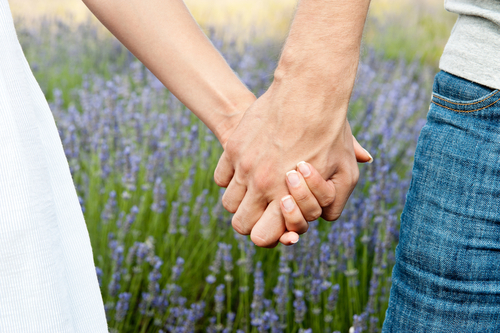 It really is that simple in Gooroo Planner to run constant capacity calculations, together with achieving targets throughout the future period. You don’t need any extra data – just the usual capacity and waiting list data that you probably run already. It’s all available via the Planner API too. So you can automate this kind of planning, download week-by-week plans for every service in the hospital all in one go, and integrate those plans into your regular planning and performance dashboards.